Guineafowl, sometimes called pintades or gleanies, are a family of birds originating from Africa, related to other game birds such as the pheasants, turkeys and partridges; they have a long history of domestication, mainly involving the helmeted guineafowl. They lay 25–30 eggs in a deep, tapering nest. Their eggs are small, dark and extremely thick-shelled. The hens have a habit of hiding their nests, and sharing it with other hens until large numbers of eggs have accumulated. The incubation period is 26–28 days, and the chicks are called "keets". 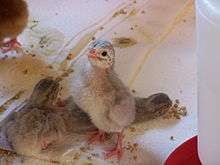 As keets, they are highly susceptible to dampness (they are indigenous to the more arid regions of Africa) and can die from following the mother through dewy grass. 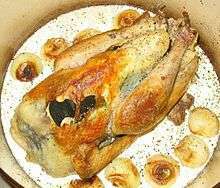 After their first two to six weeks of growth, though, they can be some of the hardiest domestic land fowl. As domestics, guineafowl are valuable pest controllers, eating many insects. They are especially beneficial in controlling the Lyme disease-carrying deer tick, as well as wasp nests. While they are rarely kept in large numbers, a few are sometimes kept with other fowl to be used as a security system against birds of prey. They will call with their loud, high shrieking voices if concerned about intruders. They are highly social birds and tend to languish when alone. J.S. Ferguson, Gardening with Guineas ISBN 0-7392-0250-2 Comprehensive discussion of all aspects of raising domesticated guineafowl. 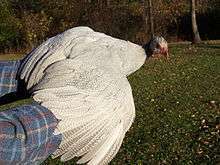 A source of guineafowl links, message board, chat room, book, and hundreds of photographs and information about raising guineafowl. Guinea Fowl International Association (GFIA) Worldwide nonprofit organization, based in Texas, USA, providing support and information to those interested in the keeping and breeding of guineafowl. 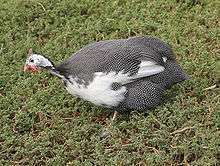 Forum, breeders list, color chart, and latest news about domesticated guineafowl.